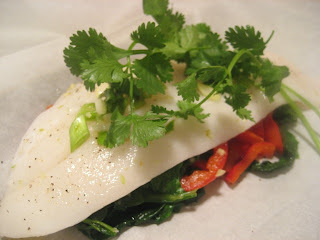 Here's what the Lime-scented Orange Roughy looks like before it is cooked. I posted about it before and it didn't look appealing at all. But just look at how gorgeous it looks before it steams. After being in the oven for 20 minutes, all the bright green loses its oomph. But it still tastes delicious. This is one of my favorite recipes from Cooking Light. A stay-at-home mom cooks healthful, seasonal foods and the occasional dessert.